Just the other day, Karla needed a fancy platter for party goodies and went to one of the many storage rooms here at Cheesecake Farms. The room was so jam-packed with treasures that she could hardly get the door open! “We just have tooooo much stuff! !” she said. Love going out for tea? Come to our very special Cheesecake and Garage Sale Tea! A private, VIP eating and shopping experience for your group!! Merchandise is always different…. You never know what you’ll find!! Our store rooms are jam-packed!! Take home arms loads of treasures at garage sale prices!! Includes a serving per person of Cheesecake Farms signature cheesecake, tea, tax & gratuity. Garage sale purchases are on your own and additional, paid at time of purchase. Mastercard/Visa & AmEx accepted for purchases over $25. You’ve heard about Old Mother Hubbard who went to her cupboard? Well, we’ve got plenty of cupboards and they are all jam packed!! 2:45 PM Shopping on Your Own! The ultimate shopping (and tea!) experience!! Not a full service English tea. Refreshments consist of one slice of Cheesecake Farms signature cheesecake and house tea per person. Less than 10 in your group? 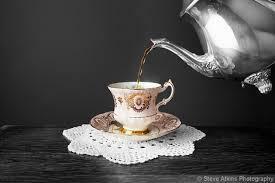 The total cost for the tea remains the same….. Total cost = $150/Mon thru Thurs or $185/Fri thru Sun. Simply determine your individual cost based on the number in your group. If you have 8 in your group, for example, divide $150 or $185 (depending on the day of the week) by 8 for the cost per person. More than 24 in your group? Call us (540-439-2188) or email (CheesecakeFarms@aol.com) with your requirements. Payment in full is required to make a reservation or schedule a date. With regret, no reservations are made or dates reserved without payment in full. Partial payments are not accepted and do not reserve a date. Payment must be in one lump sum and not as individual payments from participants. Cheesecake and beverages are adaptable for special diets. Please discuss your needs with us prior to making a reservation or we may not be able to make accommodations the day of your tea. Additional fees may apply. Artificial sweeteners or sugar substitutes are never used and are not provided for beverages. We do not have an allergy free or religiously dedicated kitchen. Plenty of free, off street! Large vehicles, vans, buses, handicap vehicles are no problem!! If someone in your group has special needs, please let us know prior to making a reservation. While we are not barrier free, some of our areas have easier access. Our restroom is not handicapped accessible but accommodations can be made when needed. 2 weeks prior to tea – refund of paid amount less $25 group cancellation fee. Less than 2 weeks prior to tea – no refund. Individual cancellations must be handled by and within your group. We do not handle individual cancellations. It’s a good idea to have a waiting list to accommodate any changes. In the unlikely event that Cheesecake Farms or is assigns has to cancel for whatever reason, you will receive a full refund which will be the entire extent of our liability. Q. Our group is larger than 24. Can we still come? A. Email or call with your requirements and we'l see what we can do. Q. Can we come on weekends? Q. What type of foods will be served? A. Refreshents include a slice of our signature Cheesecake per person and hot tea. Iced tea will be served in season. This is cheesecake and tea....not full English tea service. Q. Do you serve sugar free foods? A. We do not cook, bake, use or offer artificial sweeteners. Guests are certainly welcome to bring their own preferred sweeteners for their tea. Unsweetened fresh fruit may be substituted for cheesecake if desired but must be ordered in advance when making the reservation. Substitutions may not be available the day of your tea unless ordered in advance. Q. Can you accommodate special dietary needs? A. Sometimes. Please discuss your needs with us before you make a reservation. Q. Can we get coffee instead of tea? A. Sorry, no, but we’ll have plenty of hot water on hand (sugar and creamers, too!) so guests who prefer coffee can bring their own instant to stir into hot water at their table. Q. Are you handicap accessible? A. We are not barrier free, but some of our areas have easier access. Please discuss your needs with us before making a reservation. Q. Can we pay at the door? A. Decide on a date & time plus an alternate or two. Call or email to check availability. Tell us the number in your group. Pay in full to reserve your date. That's it! We'll take it from there! !